Those 99 bottles of beer on the wall? 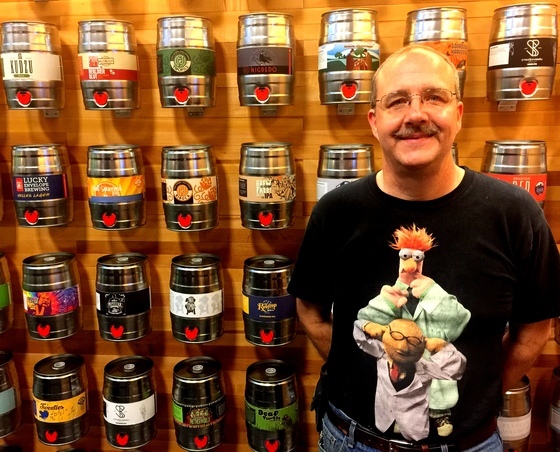 They're actually 102 mini-kegs, faithfully recreating recipes submitted by scores of craft breweries around the world. Jim Mitchell, chief science officer of Seattle start-up PicoBrew, wants you brew any or all of them at home. You buy a PicoBrew machine (the size of a biggish microwave oven) and a re-usable 5-liter keg, then order a kit of grain, malt and hops from one of 100-plus participating craft breweries. (Mitchell's "Beaker" tee-shirt not required.) The fixings arrive by UPS, and you, the home brewer, feed the ingredients into the machine. The PicoBrew goes through a standard brewing cycle: hot-water mash tun, adding yeast, pitching hops, fermentation, lagering, and so on, and after several days of conditioning you've got a couple of six-packs worth of craft beer. Beers offer almost infinite variations on the theme of fermented grain, depending on differences in the grain itself, in the hops, in the yeast, in fermentation temperature, in additional flavorings you might want to add on your own, in the time and temperature of the conditioning process. The cost of the ingredients, selected online, runs between $20 and $30. An RFID chip in the PicoPak shipment transmits the appropriate details to the machine itself. A display screen lets the home brewer monitor the progress of the beer. The latest piece of equipment, the Pico C, goes on sale next week at nationally (Macy's, Bed Bath & Beyond, even Amazon) for $549. It's the third generation of Pico, which launched four years ago with a $2,000 device aimed at professional brewers who needed to make small batches of test products. The company subsequently introduced a second product for home brewers at $800. Coming in January, an optional, $250 attachment that lets home brewers distill essential oils or even, ahem, grain alcohol (but only if properly licensed; in fact the company could not demonstrate its PicoStill at its tap room and had to invite backers and media to a bonded craft distillery in a light-industrial park south of Seattle). Thus far, Pico Brew has funded all its products through online kickstarter campaigns, and has set records doing so. The latest round, for the Pico C, raised a hefty $2 million in under 6 weeks. The founders are brothers Jim and Bill Mitchell, food scientists and former Microsoft executives, and engineer Avi Geiger. There's also an on-staff brewmaster, Annie Johnson, who curates the recipes for the participating breweries. The biggest concern expressed is whether the Pico devices are too complicated for beginners but too simple for more experienced home brewers. And whether the result is worth it: it's still about $2 per beer. Taking too long? Need an extra brew-keg? Another $100. It's unlikely that cost alone will deter craft beer enthusiasts. The possibility of tasting obscure beers from distant cities carries an appeal that any wine geek will understand, the difference being that you can go to pretty much any wine shop and purchase a sangiovese from Italy or a malbec from Argentina right off the shelf. Pico Brew lets the hobby brewer sip a rye stout from Flying Lion Brewery in nearby Georgetown or a bitter Bibock from Birrificio Italiano in the distant Alps of northern Italy. You also have to get rid of the spent grain. It's compostable, thank goodness. "Great for chickens," said one taster at the launch party. In Seattle, at least, you can keep up to 5 chickens in your backyard. This page contains a single entry by Cornichon published on October 27, 2017 1:13 PM. John Sollid, the artist who defines how we see the Market was the previous entry in this blog. Fexy isn't an exotic new food, but you need to know about it anyway is the next entry in this blog. Jon Rowley (1943-2017): A life in quest of the "Beautiful Taste"
Amazon, Voulez-Vous Carrefour Avec Moi?